DC Nation janvier 2019 - Buzz Comics, le forum comics du Grand Débat. Non, pas Brian Bendis sur la Legion. C'est beau être une série où ça parle, c'est aussi une série où ça bouge. Etant donné qu'il tease aussi Batman Beyond, je pense à un Zero Hour like, avec des personnages des futurs de DC. Parce qu'il ne faut pas se leurrer, il va l'avoir son event. Je pense que ce sera lié à Leviathan car Talia louvoie dans plusieurs titres. Green Arrow/Hawkeye avec Lemire pour que ce dernier se fasse pardonner. De nouveaux titres Wallmart (Wonder Woman, Titans, Swamp Thing)... les inédits devaient pas être compilés dans un TP? Teen Titans and Justice League Of America will be canceled, replaced by a new Titans #1 and Wonder Woman #1. Superman and Batman will continue. And there will be new titles, The Flash and Swamp Thing. Surprisingly this time, no Aquaman to accompany his billion dollar movie. 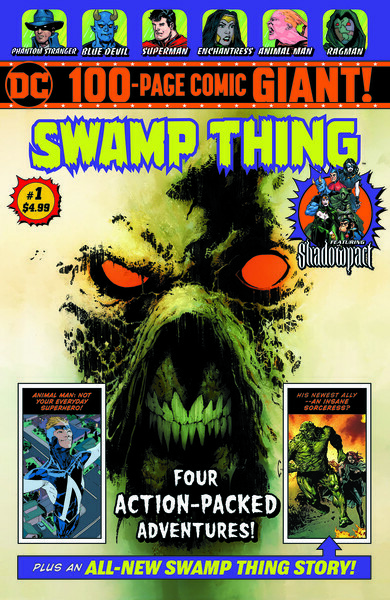 The first Swamp Thing 100-Page Giant includes an original story, Desert of Ash by Tim Seeley and Mike Perkins with Swamp Thing and his witch companion Briar as they face the pyromaniac Char Man, who possesses the ability to control flames, a power granted by the elemental spirits of fire itself. Issues #2 and #3 feature Bog of Blood, a two-parter by Seeley and Joëlle Jones, which introduces a terrifying and potentially supernatural slasher stalking the swamps of Louisiana. The comic will also include Jeff Lemire, Travel Foreman and Dan Green’s The Hunt, from Animal Man, and Raise Dem Bones from Scott Snyder and Yanick Paquette Swamp Thing, plus Death in a Small Town, with Detective Chimp and Shadowpact. The Flash 100-Page Giant #1 features an all-new twelve-part story by Gail Simone and Clayton Henry, Glass Houses, in which Barry Allen is dedicated to keeping the streets of Central City safe as the Fastest Man Alive, but when his old foe Mirror Master shows up looking to cause trouble, it’s up to the Flash to stop him. 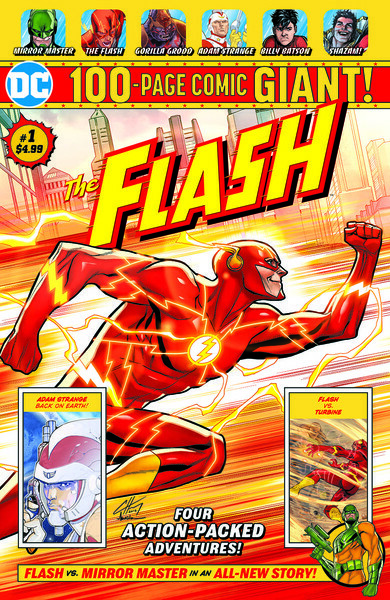 This book also includes Flash stories by Francis Manapul and Brian Buccellato, Adam Strange by Andy Diggle and Pasqual Ferry and Shazam, by Geoff Johns and Gary Frank. 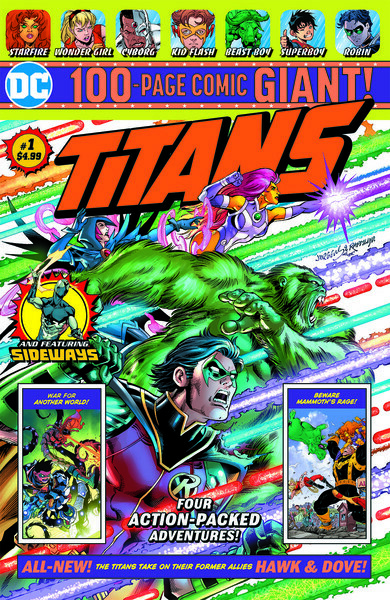 Titans 100-Page Giant #1, has Dan Jurgens continuing his original story with Scot Eaton and Wayne Faucher. In addition, the book will continue with Geoff Johns and Tom Grummett’s Teen Titans from 2004, Peter Tomasi’s Super Sons and Kenneth Rocafort, Dan DiDio, and Max Raynor’s Sideways. 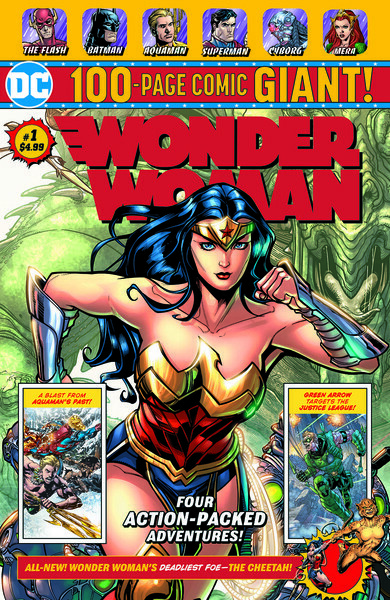 Wonder Woman #1 will continue the original Wonder Woman story by Amanda Conner, Jimmy Palmiotti, Tom Derenick, and Chad Hardin from the Walmart Justice League comic, with Justice League and Aquaman stories from Geoff Johns, Ivan Reis, and Joe Prado, plus 2006’s Who Is Wonder Woman? by Allan Heinberg, Rachel Dodson, and Terry Dodson. Dernière modification par Fred le mallrat ; 18/01/2019 à 12h02. Bill Sienkiewicz a la même réaction que toi. Seems there were quite a few unfortunate casualties from the DC Comics lay-off, and I’m sorry to hear about these folks’ dismissal, and hoping they’ll all land on their feet, in even better positions of creativity than they exited. BUT I’m particularly stunned into head-shaking incredulity by their ouster of Mark Chiarello, one of the most creative, brilliant,and absolutely stand-up guys I’ve ever had the privilege and pleasure to work with- and one I’m honored to call a good friend. I’m sure Mark is going to to be fine, and more; I’m sure he’ll thrive. I’m the first to admit decisions that go into the running of a corporate entity - an entity peopled by talented, creatives- as well as (what might be referred to ingloriously) as suits and bean-counters- often make no sense to me, even under the best of circumstances. This latest turn is no exception.